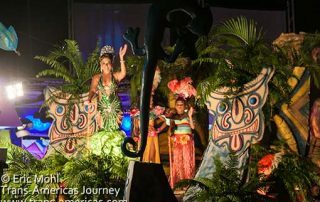 Go inside the spectacular week-long Carnival celebration in Las Tablas, Panama in our 6-part travel guide series to see the dueling Carnival queens, fireworks, parades, costumes, crowds, and more. Crowning the two Carnival queens in La Villa de Los Santos and Las Tablas, Panama. 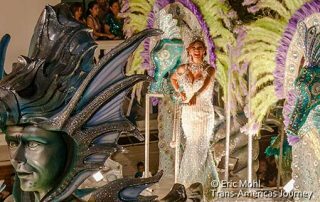 Day 1 of Carnival in Las Tablas, Panama including video and photos of the floats, fireworks, and rival Carnival queens from Calle Abajo and Calle Arriba. 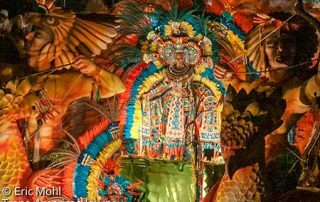 Day 2 of Carnival in Las Tablas, Panama including video and photos of the floats, fireworks, and rival queens as things start to heat up. 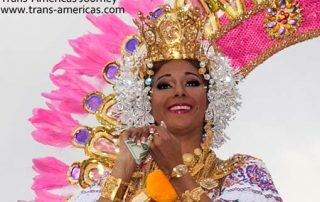 Day 3 of Carnival in Las Tablas, Panama including the debut of next year's Calle Abajo queen. 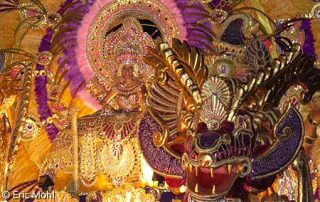 Day 4 of Carnival in Las Tablas, Panama including traditional polleras and a dramatic face off between the Calle Arriba and Calle Abajo queens called a topon. 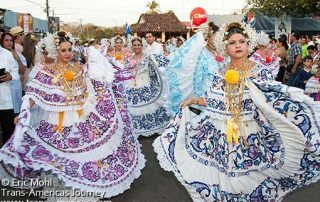 Elaborate, hand-crafted polleras, the traditional dress of Panama, on parade during Carnival celebrations in Las Tablas, Santo Domingo and Los Santos.